You are here: Home / Desserts / Chocolate and Caramel / Vegan Caramel Apples! Vegan caramel without dairy or coconut milk! Caramel is something I thought I may never be able to eat again after going vegan. I wasn’t sure how to make caramel or if it was even possible without dairy, but I was determined to try! After years living without caramel, I came across a vegan caramel recipe in a magazine. It called for coconut milk instead of dairy. I was so excited that I made it that same day. I thought it was delicious, but it definitely had a coconut flavor, and not the normal caramel flavor that I remembered. My son who hates coconut wouldn’t touch it. It seemed like there had to be another way to get the right consistency and flavor. What do you use instead of dairy? After much trial and error, I discovered that refined coconut oil and soy milk work great as a replacement for dairy or coconut milk. If you use the refined coconut oil, it doesn’t have the flavor of coconut, and the soy milk gives it the right consistency. 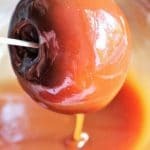 How do I make vegan caramel apples? Start with a clean medium sized sauce pan and add the sugar and water and cream of tartar. Heat on medium heat bringing the sugar water will start to boil. (Don’t stir. Just pick up the sauce pan and swish around the sugar if needed). Watch the sugar mixture closely! After it boils for about 6-8 minutes, it will start to get slightly darker and smell like caramel. Boil for about 10-20 more seconds to let it turn a medium brown color (this color change will be slight when using vegan unbleached sugar). Remove from heat and immediately add coconut oil and stir with a metal whisk for a few seconds. Add the soy milk and continue to stir until smooth and everything is well mixed. (It will bubble up and may spatter, so be careful)! While it’s cooling, prepare you apples by washing and drying them. Then remove the stems and insert a stick into the top. Line a tray with parchment paper to set the apples on after they have been dipped. Reheat the caramel sauce until it is the right consistency for dipping apples. (If your caramel is thin, let it boil again for about 30 seconds. If it is too thick add a teaspoon or two of soy milk and reheat and stir until it’s a sticky sauce. Dip the apples in the caramel. Let the excess drip off and place on the parchment lined tray. Allow to cool in the refrigerator for about 30 minutes. They will come off the paper easily once they have cooled completely. I have found that if you let the caramel sauce cool slightly and then heat on low again and let it bubble for about 30 seconds, it makes it stickier and a just the right consistency for making caramel apples. Caramel is tricky! 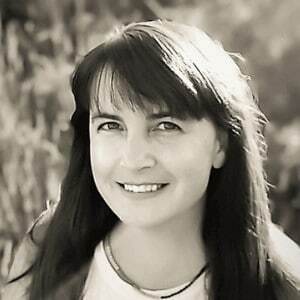 Nearly every recipe on my blog is easy and can be done by someone relatively inexperienced in the kitchen, however caramel, is more of an exact science. You must watch it carefully. It goes from sugar to caramel to a burnt mess in a matter of about 30 seconds. Just know that you may have to throw out your first attempt, but once you get it right, it becomes easy. Every time I made vegan caramel it would come out differently and many times it would seem perfect while still warm, but then get gritty and start to crystallize when it cooled. So, I learned to add a pinch of cream of tartar to keep the sugar smooth. I also learned the hard way to have the coconut oil and soy milk measured and waiting to pour into the sugar mixture the second it caramelizes. Adding the oil and milk reduces the temperature and keeps it from burning. It the few seconds that it would take you to find and measure the oil and soy milk, your sugar will burn! When using vegan sugar, it is already slightly brown, so you will not see a big color change. Go by smell more than color. 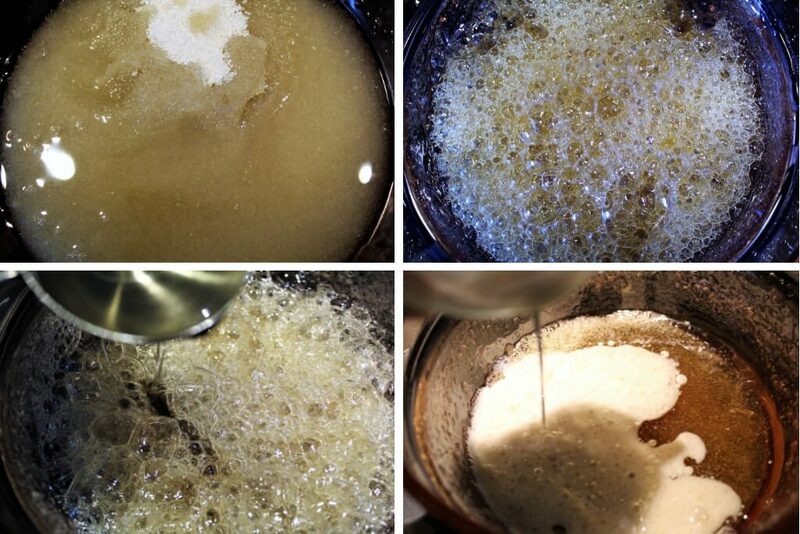 ( It will start to smell like caramel or even slightly burnt sugar). Add the oil first, give it a little stir with a whisk and then add the milk. This will cool it down a little and it wont spatter as much once you add the soy milk. When you do add the milk, it will still bubble up and my spatter a little, so use a long-handled whisk to stir and stand back. (Make sure children are back and out of your way)! If your sauce is too runny you can heat it again on low for about 30-60 seconds to evaporate some liquid out of it and firm it up. (But don’t let it burn)! Having a fall party? Serve a delicious Pumpkin Bean Soup sure to please everyone! Don’t forget to pin the vegan caramel apple recipe for later! Vegan caramel apple recipe that tastes like the real deal! Turn the heat on to medium. The sugar water will start to boil. Don’t stir, just pick up the sauce pan and swish around the sugar if needed. Watch the sugar mixture closely! After it boils for about 6-8 minutes, it will start to get slightly darker and smell like caramel. At this point let it boil for about 10-20 more seconds to let it turn a medium brown color (this color change will be slight when using vegan unbleached sugar). Remove from heat and immediately add coconut oil and stir with a long handled metal whisk for a few seconds. Add the soy milk (It will bubble up and may spatter, so be careful)! Continue to stir until smooth and everything is well mixed. Then allow to cool to room temperature. Reheat the caramel sauce until it begins to bubble and allow it to bubble on low heat for 45 seconds. Allow it to cool for about 10 minutes until it starts to slightly firm up and get sticky. While your caramel is cooling, take out the apple stem, wash the and dry the apples well and place a Popsicle stick in the top of each apple. Cover a tray or cookie sheet covered with parchment paper to put the apples on after they are dipped in caramel. Once your caramel is a thick sticky consistency, roll the apples in the caramel, coating the whole apple with the caramel. (You can use a spoon to help you coat the apple completely). Allow to drip for a few seconds and then place on parchment paper. Put the tray of apples in the fridge to cool completely. (They will easily come off the parchment paper once cool). Watch the caramel closely as it's cooking don't walk away from it! You will know your caramel is done cooking when it smells like caramel. The smell is as important as the color change in determining when to remove it from the stove. Make sure to remove it from the burner completely before adding the oil and soy milk. Don't just turn off the heat. Would this recipe also work for caramel popcorn? Thinking to try it for apples and popcorn both! Sounds like fun for Christmas Eve!! Will update after we try it. You can simply leave it out. It helps to make the caramel smooth. It occasionally gets a little gritty if I leave it out, but it’s not necessary. I tried it on your aquafaba ice cream…I’m addicted! Then I tried the caramel apples…tastes like summer! I don’t know how you figure these things out but your recipes are incredible. Thanks so much Megan! You’re so sweet! Happy that you liked it! This is incredible! It’ll be my go to caramel recipe from now on.